Remember the times when you were a kid, and visiting some relative or family friend turned out to be the most boring thing you've ever done? The recipe below is just one temptation hosts might have in Romania to keep children enthusiastic about the visit, and mostly quiet throughout the time the grownups chat (unless the dessert runs out too quickly, which causes some emergencies). And who says this has to be a kid-only dessert? Add a bit of alcohol to the filling (as in the notes below), and you've got the perfect dessert for parties of all ages. - Finely grind the biscuits, and mix with the sugar. - Melt the butter on low heat, and add to the biscuits. Mix. - Carefully dissolve the cocoa powder into the milk, and add the rum or vanilla essence. When ready, add to the biscuits, and mix. - Finely chop the walnuts, and add to the biscuits. Mix everything together. If all went well, it sticks together when pressed. If the mixture is too watery, incorporate a few more finely ground biscuits into the mixture. - Next, let's proceed to form the blasts. Pick about 1-2 tablespoons of the mixture, and press it flat in you palm. Add a maraschino cherry in the center, then roll the mixture to uniformly cover it all around. Finally, covering it with coconut shreds. Repeat. - Serve cold or at room temperature. Given that you've used melted butter for this recipe, it probably means that you need to let it sit and cool for a while after the preparation. I usually just refrigerate them overnight, which also helps make each blast firmer. - Note: while maraschino cherries have some nice flavor and consistency, I do love a different twist to this recipe. It takes some preparation in advance, but it is definitely worth the effort. Here's what you do. Takes about five cups of berries, and poke each of them with a toothpick (to help the juice flow out). Place in a jar, cover with two cups of sugar, and shake gently to mix. Cover, and let sit. After about a week, the berries would have bled some juice which also caused the sugar to melt. Add about 250 ml of vodka, and let sit for one to two months. Aside from the delicious blueberry liquor which you can now enjoy, you also have some alcohol-infused blueberries for your desserts. Use 2-3 such blueberries as a filling for the chocolate blasts, instead of the maraschino cherries. - The recipe can be presented in many ways. For a romantic dinner, place the chocolate blasts on top of red rose petals (or next to red rose blooms). 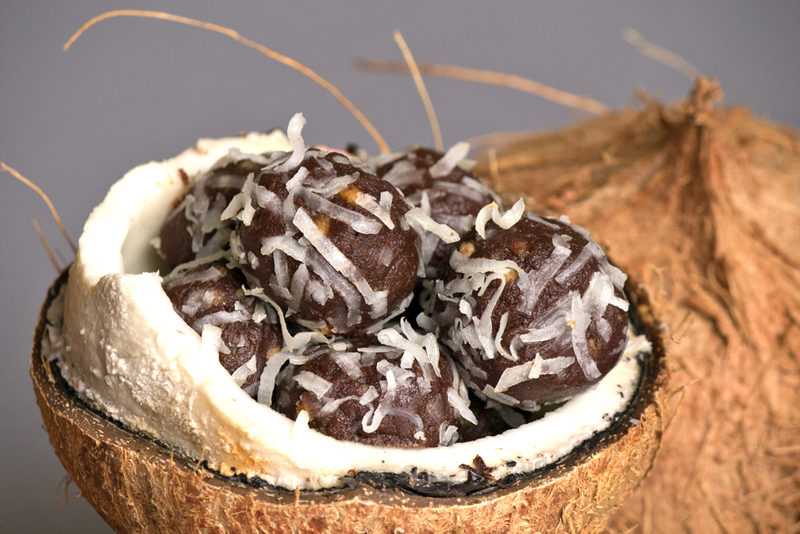 For a special occasion, cut open some coconuts in halves, use a paper towel to dry them out, then place the chocolate blasts inside (as in the photo above).